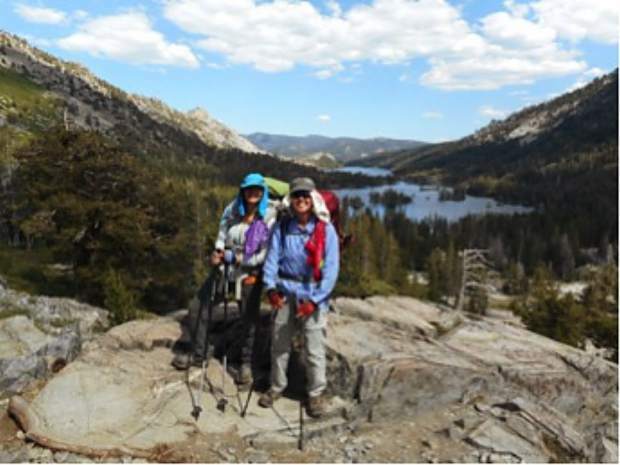 Hikers pose above Echo Lakes in Desolation Wilderness. The Tahoe Fund is launching the 2018 fundraising season with the announcement of three new Signature Projects, geared to help improve outdoor recreation in the Tahoe Basin while restoring the area’s environment. The projects include Tahoe Rim Trail restoration in Desolation Wilderness to improve usability and safety; transformation of the Kings Beach Trail into a multi-feature trail; and the planting of 10,000 sugar pine seedlings around Lake Tahoe. Desolation Wilderness, one of the most scenic hiking and backpacking destinations on the Tahoe Rim Trail, has been severely impacted from increased use combined with extreme weather events. Donations to this Tahoe Fund project will benefit the Tahoe Rim Trail Association to rehabilitate a section of the trail, improve safety for trail users and reduce the flow of sediment into alpine lakes and streams. Every dollar given to this unique project will be matched up to $40,000 through the end of the year. The Tahoe Fund has a goal to raise $15,000 to benefit the Kings Beach Trail project, which aims to transform a current Off-Highway Vehicle trail with major erosion issues into a multi-feature trail for use by mountain bikes, motorbikes, hikers and equestrians. In partnership with the Tahoe Area Mountain Bike Association, the U.S. Forest Service, the Truckee Tahoe Airport and the North Tahoe Public Utility District, the newly designed trail will help prevent the flow of sediment from the eroding trail into Griff Creek and Lake Tahoe. The Tahoe Fund’s third Signature Project will help bring new life to the forest, with a goal of raising $15,000 for the Sugar Pine Foundation in an effort to plant 10,000 seedlings around the Basin. Volunteer plantings are scheduled at the Emerald Fire and Angora Fire scars as well as Spooner Summit, Sand Harbor, Tahoe Vista and along the new Incline Village bike path. To learn more about the Tahoe Fund and how you can get involved in their projects, please visit tahoefund.org.